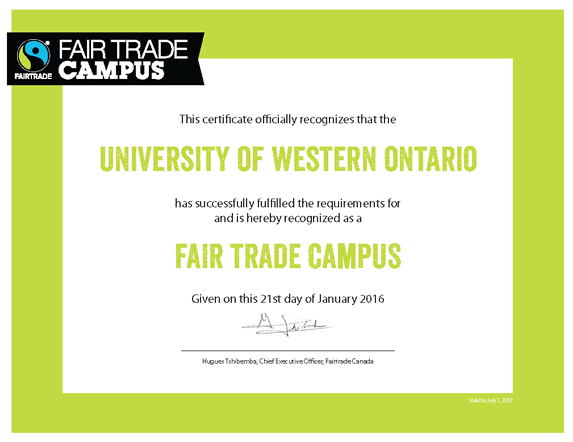 Western University Designated Canada's 11th Fair Trade Campus! All residence dining operations, campus outlets and vending services now offer products required to meet Western's Fair Trade Campus designation. "With so many claims of fairness and sustainability in the marketplace, third-party Fairtrade verification is an invaluable tool to ensure purchases actually connect with these same sourcing values," says Kevin McCabe, Hospitality Services Associate Director. "Fair trade is important to Hospitality Services because it means fair pay and safe working conditions for farmers. It means no forced child labor, and support for their communities. It means limited amounts of pesticides and fertilizers are used with proper water management, making them better for the environment. Hospitality Services intends to continue to grow fair trade through post Fair Trade Campus designation engagement, setting yearly goals, planning events, introducing new products and working closely with Engineers Without Borders to further this valuable cause." Continue reading the original article from The Canadian Fair Trade Network website.